There were four of us with different themes. Last years were Cakes, Birds, Teddy Bears & Fantasy. I’m sure over the next few weeks I’ll show you my other RR squares! Anyway, So here it is! Have any of you taken part in a RR before? I’ve tried to complete one this year but its failed miserably due to one person falling behind & not communicating with the rest of the group! It’s a little frustrating when that happens. It’s worth mentioning that when everyone pulls together & does it to the deadline (give or take a week), it really pays off & you end up with an awesome finished piece! 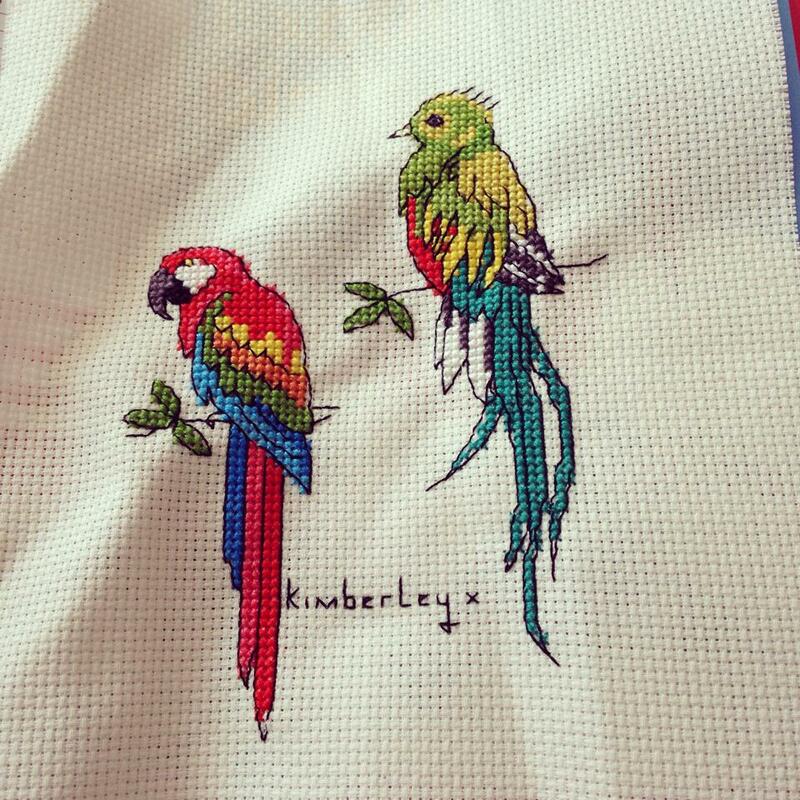 If any of you lovely stitchers are interested in getting involved in a round robin then let me know. It seems to work well in groups of four… We would send each other the addresses, agree on an order & completion dates & away we go! 🙂 drop me a comment if you would be interested! On another note, I purchased a new handbag this week (a guilty pleasure) & it has hoops on either side where the straps could be extended. Anyway, I was thinking it would be a good idea to stitch a little keyring to attach to my bag & personalise it. So, I started browsing my magazines (as you do) & came across 3 different small designs I want to stitch for special events I have coming up in the next 2 months. Typically, I’ve now been sidetracked with starting these little card designs for my friends… So watch this space… more small projects to share soon!! I totally understand! I work shift work so my hours can vary which isn’t great for my hobby lol. It would be best if we had 4 people to do one but I’m more than happy to give it a go! Can you maybe put out some feelers and see if we can get 2 more to join us to make a group? If you have Facebook I really would recommend a group I’m on called ‘cross stitch friends uk’. It’s a great group of cross Stitchers that share their work with each other & have really friendly chats about things they are unsure of! I don’t have any friends that cross stitch but that site really helps build up a lovely cross stitch community you can be a part of!